Giving residents, businesses and visitors yet another reason to “come early, stay late…where something for everyone awaits” to discover Downtown Boca’s great dining, shopping, culture, entertainment and lifestyle offerings, the destination launched a monthly open-to-the-public Friday Night LIVE! themed entertainment series on Friday night, March 2nd. Born from the success of Downtown Boca’s inaugural 2011 Meet Me On The Promenade street-filling festival, the Friday Night LIVE! series debuts with City Link’s Boca Beerfest, a ticketed event at Mizner Park Amphitheater in March that will feature 100+ brews and a selection of wines, live entertainment, local bands, gourmet food trucks, a cigar and smoking area, a VIP section on the Museum Terrace with unlimited liquor and wine bar and catered food, and other activities with an “after party” at Biergarten. 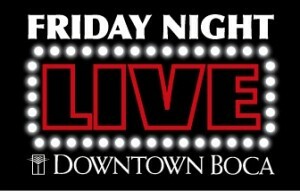 On the first Friday of every month thereafter, the Friday Night LIVE! series will fill parts of Downtown (including Sanborn Square and Palmetto Park Road), showcasing live themed entertainment by award-winning bands and vocalists as participating shops, restaurants, and clubs extend their hours for “shopping and strolling” and offer Friday Night LIVE! samplings, discounts, and specials. In addition, gourmet food trucks will line the event streets with café style seating, art galleries plan exhibitions, boutiques may feature streetside fashion or trunk shows, and more for exploring and enjoying the destination, from Mizner Park to Royal Palm Place, including the signature collection of shops and boutiques, restaurants and galleries along Palmetto Park Road and Plaza Real South. Included in the themed plans, are crowd-pleasing, family friendly live performances from Latin jazz and bossa to Rock ’n Roll, country and island sounds; “chances to win” gift certificates and prizes; fun activities such as street-filling sock hops, themed dance showcases by Fred Astaire Dance Studio instructors and students, old fashioned hayrides along East Boca Raton Road, street artists, a July lemonade stand décor and beverage contest, a Brazilian conga line along Palmetto Park Road; and at times late night “after parties” at Downtown Boca pubs and clubs. Dates* and themes* planned, include the following; unless noted, all evenings are free and begin with festivities beginning at 6:30 p.m. and live entertainment to take the stage at 7:30 p.m.
*rain dates may be scheduled for following Friday subject to artist availability; themes subject to change. Most series events are free; **admission fee charged.